Creating an App in Aione App Builder is as simple as ABC. Your dashboard includes three sections: One is to add new components, second is Add new taxonomy and third one is to add new template. The very first step is to create a component. So as to add post items related to the component. Let's say you want to have a job opening portal. So, you will create a component named 'Opening', where you will provide the title and description for the component. Next you need to create templates. Since there will be a archive view and single view of the post. So you need to create two templates. In the edit component section set the templates for single and archive view. Create custom fields in case you require more fields. Select the option 'fields' in the Aione App Builder menu item. Then provide a title for the custom fields and start adding fields. For example, Opening can be the title for the custom field and fields that are added are qualification, experience, career level, job description, key skills, date posted, last date, employee id, and so on. Next step is to attach custom fields to the components. Select the component name with which you want to attach the post type. 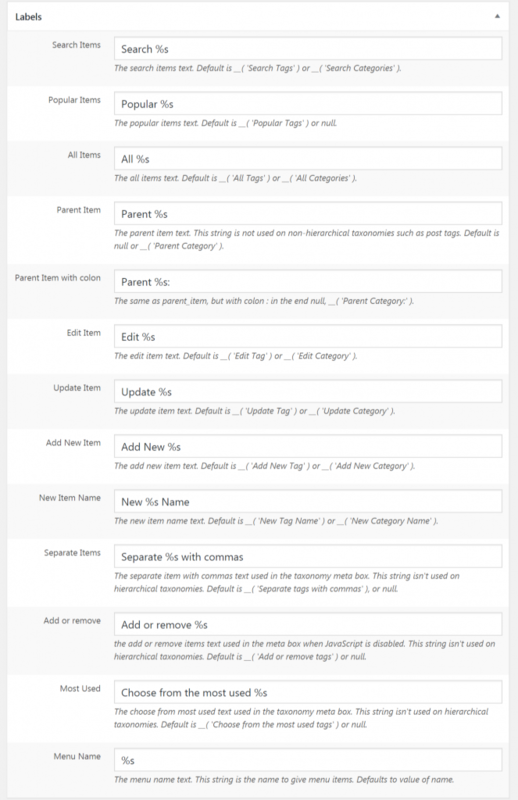 Create Taxonomy if you further want to classify the custom fields. In the Aione App Builder select taxonomy option to create the fields. Attach the taxonomy to the components. In the edit taxonomy section select the post type that is to be used with the component. In the edit component section select the taxonomies that you want to show with the component (opening). 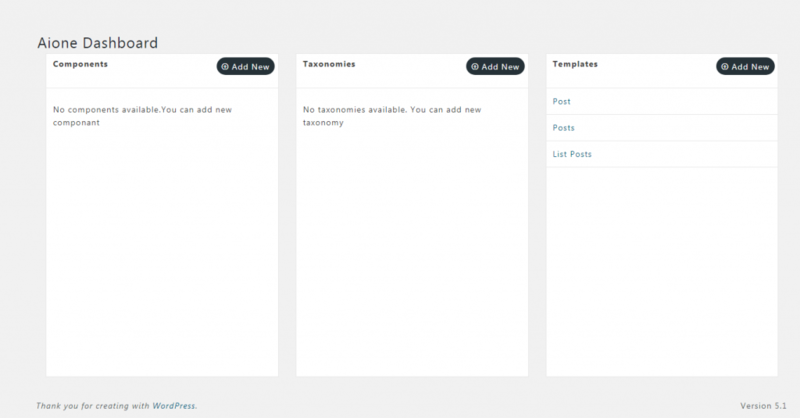 Selected taxonomies will start listing in the components sub-menu. For example, three taxonomies are selected that is, qualification, key skills, and experience for 'Openings' component. When you hover over the 'Openings' component taxonomies will be listed. Select the taxonomy to further add more fields. Components are used to create custom posts. For instance to create a job portal your first step will be to create the component. To enter the details of component select the component option in the Aione App Builder and then add the title and description for it. For job portal application the name of the component could be 'Openings'. You can set the position of the component from the top left section of the screen. 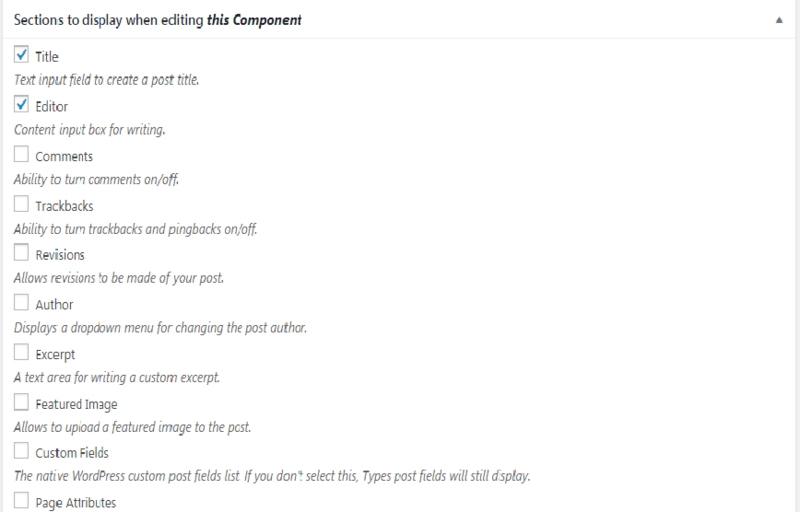 The opening component will allow you to add different post titles in just few seconds. Below is the fields that you are required to fill in while creating a component. 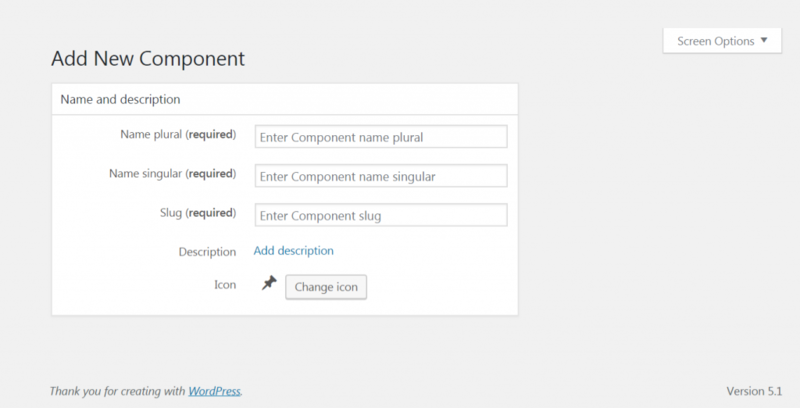 Name plural (required): Give a plural name to the component. Description: Make a description in about two to three lines. Template Designing is the second step after creating the component. It allows you to create two types of views one is Single and second is Archive view (to show the list view). 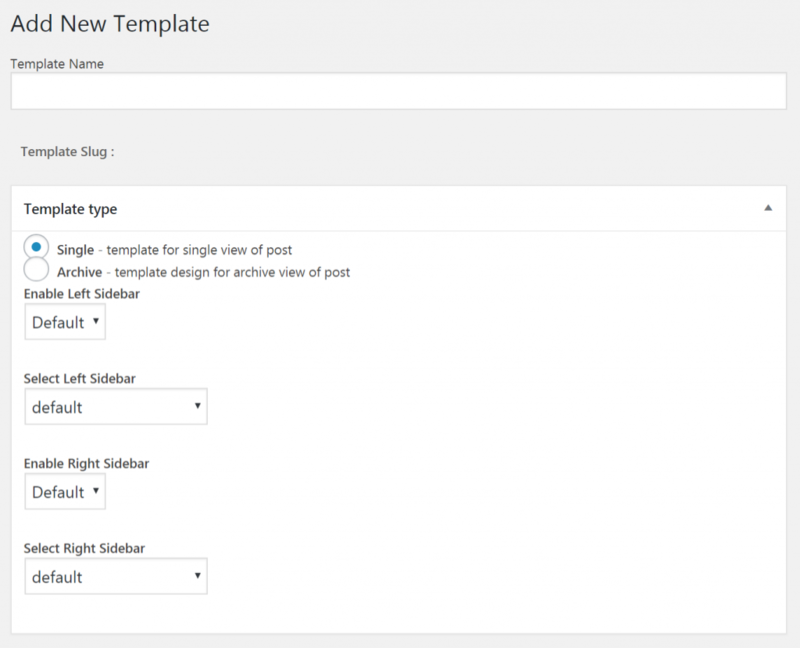 After designing the templates you can set the templates to the component for which it is designed. It allows you to assign names to the available list of different fields below. Add New: It is label for add new text. The default is Add New for both hierarchical and non-hierarchical types. Add New Item: It is the label for add new item text. Default is Add New Post/Add New Page. Edit Item: It is a label for edit item text. Default is Edit Post/Edit Page. New Item: It is label for new item text. Default is New Post/New Page. View Item: It is a label for view item text. The default is View Post/View Page. Search Items: It is a label for search items text. Default is Search Posts/Search Pages. Not Found: It is a label for not found text. Default is No posts found/No pages found. Not Found In Trash: It is a label for not found in trash text. The default is No posts found in Trash/No pages found in Trash. Parent Description: It is a label for parent text. This string isn't used on non-hierarchical types. In hierarchical ones the default is Parent Page. All Items: It is a label for all items text used in the menu. Default is the Name label. Enter title here: It is a label for text used as the placeholder of post title. Default is the "Enter title here". Taxonomies are used to classify the custom fields. After creating taxonomies you can select the type of taxonomy to be used with the component i.e it can be either categories or tags. These fields allows you add additional details to the components. You can check or uncheck the fields as per your requirement. Below is the list of sections that can be displayed when editing the current component. Title: Text input field to create a post title. 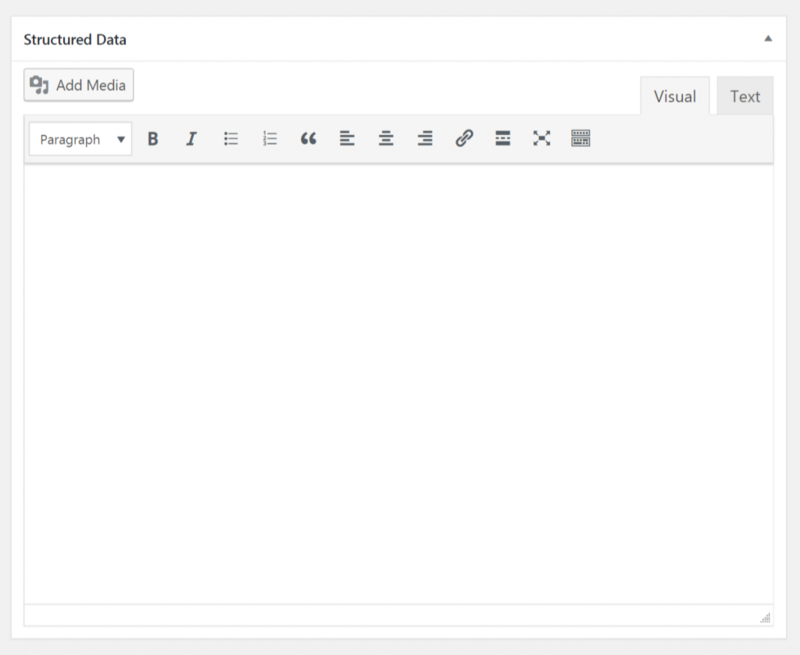 Editor: Content input box for writing. Comments: Ability to turn comments on/off. Trackbacks: Ability to turn trackbacks and pingbacks on/off. Revisions: Allows revisions to be made of your post. Author: Displays a dropdown menu for changing the post author. Excerpt: A text area for writing a custom excerpt. Featured Image: Allows to upload a featured image to the post. 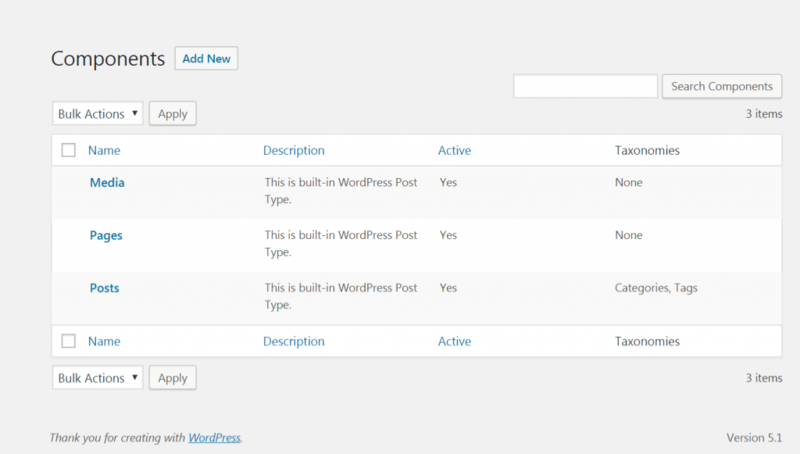 Custom Fields: The native WordPress custom post fields list. If you don't select this, Types post fields will still display. 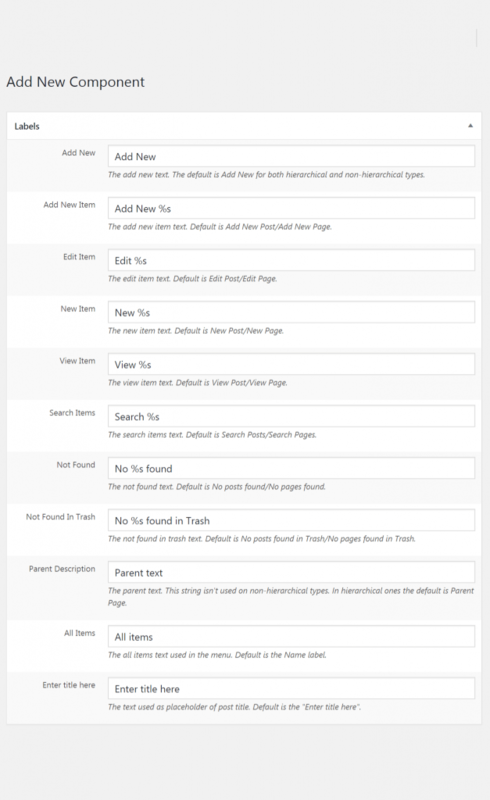 Page Attributes: Menu order and page parent (only available for hierarchical posts). Post Formats: A selector for the format to use for the post. Some more options are there which you can check or uncheck as per your requirement. Rewrite: You can Rewrite permalinks in either normal WordPress URL logic or a custom URL format. False to prevent rewrite. Default: true and use post type as a slug. This option allows permalinks to be prepended with the front base. Example: if your permalink structure is /blog/, then your links will be: false->/news/, true->/blog/news/. Defaults to true. Feeds: Defaults to has_archive value. has_archive: It allows to have custom archive slug for CPT. Default: not set. The input field is optional. The default is the value of rewrite or CPT slug. show_ui: Generate a default UI for managing this post type. Default: The value of public argument. publicly_queryable: Whether post_type queries can be performed from the front end. Default: value of public argument. exclude_from_search: Whether to exclude posts with this post type from search results. Default: The value of the opposite of the public argument. hierarchical: Whether the post type is hierarchical. Allows Parent to be specified. Default: false. can_export: Can this post_type be exported. Default: true. show_in_nav_menus: Whether post_type is available for selection in navigation menus. Default: The value of public argument. query_var: Disable to prevent queries like "mysite.com/?post_type=example". Enable to use queries like "mysite.com/?post_type=example". Enable and set a value to use queries like "mysite.com/?query_var_value=example". Default: true - set to $post_type. Permalink epmask (Input Field): Default value EP_PERMALINK. More info here link. show_in_rest: Whether to expose this post type in the REST API. Default: true. Rest Base (Input Field): The base slug that this post type will use when accessed using the REST API. Default: $post_type. Go to Aione App Builder select the taxonomy menu item. A screen appears that displays the list of all the existing taxonomies and add new option. When you click on the add new button which is in the top left of the screen it displays a screen where you can fill the details of new taxonomy. Name plural (required): Create a plural name. Description: Create a description in 2-3 lines. This section allows you to add names to available fields. Search Items: It is a label for search items text. Default is __( 'Search Tags' ) or __( 'Search Categories' ). Popular Items: It is a label for popular items text. Default is __( 'Popular Tags' ) or null. All Items: It is a label all items text. Default is __( 'All Tags' ) or __( 'All Categories' ). Parent Item: It is a label for parent item text. This string is not used on non-hierarchical taxonomies such as post tags. Default is null or __( 'Parent Category' ). Parent Item with colon: It is a label for same as parent_item, but with colon : in the end null, __( 'Parent Category:' ). Edit Item: It is a label for edit item text. Default is __( 'Edit Tag' ) or __( 'Edit Category' ). Update Item: It is a label for update item text. Default is __( 'Update Tag' ) or __( 'Update Category' ). Add New Item: It is a label for add new item text. Default is __( 'Add New Tag' ) or __( 'Add New Category' ). New Item Name: It is a label for new item name text. Default is __( 'New Tag Name' ) or __( 'New Category Name' ). Separate Items: It is a label for separate item with commas text used in the taxonomy meta box. This string isn't used on hierarchical taxonomies. Default is __( 'Separate tags with commas' ), or null. Most Used: It is a label for choose from most used text used in the taxonomy meta box. This string isn't used on hierarchical taxonomies. Default is __( 'Choose from the most used tags' ) or null. Menu Name: It is a label for menu name text. This string is the name to give menu items. Defaults to value of name. Hierarchical - like post categories, with parent / children relationship and checkboxes to select taxonomy. Flat - like post tags, with a text input to enter terms. Taxonomies are usually used with the components. This post type section will also display the component name so that you can associate the component with the taxonomy and you can check or uncheck other available options. There are many more features that you can check or uncheck as per your requirement. Rewrite: Rewrite permalinks with this format. The default will use $taxonomy as query var. Optional (Input Field): Replace taxonomy slug with this - defaults to taxonomy slug. Select this option to allow permalinks to be prepended with front base. Defaults to true. Hierarchical URLs: True or false allow hierarchical urls (implemented in Version 3.1). show_ui: Whether to generate a default UI for managing this taxonomy. Default: if not set, defaults to value of the public argument. show_in_nav_menus: True makes this taxonomy available for selection in navigation menus. Default: if not set, defaults to value of public argument. show_tagcloud: Whether to allow the Tag Cloud widget to use this taxonomy. Default: if not set, defaults to value of show_ui argument. 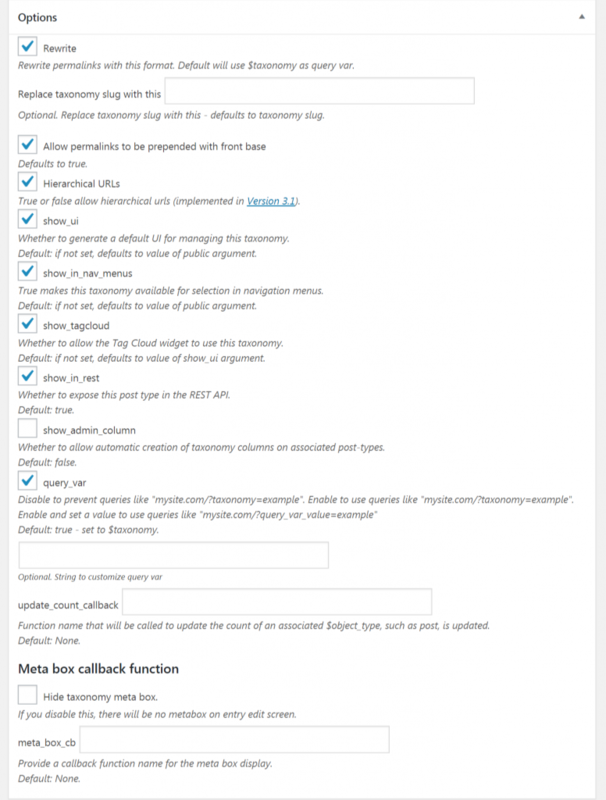 show_admin_column: Whether to allow automatic creation of taxonomy columns on associated post-types. Default: false. update_count_callback (Input Field): Function name that will be called to update the count of an associated $object_type, such as post, is updated. Default: None. Meta box callback function:Hide taxonomy meta box. (Check box) If you disable this, there will be no metabox on entry edit screen. meta_box_cb (Input Field): Provide a callback function name for the meta box display. Default: None. Templates provide a screen where you can do designing so as to show the data in a proper format. You need to select the view for design before creating it. That is it should be either a single view or archive view. This screen provides the below-listed options to customize the template. 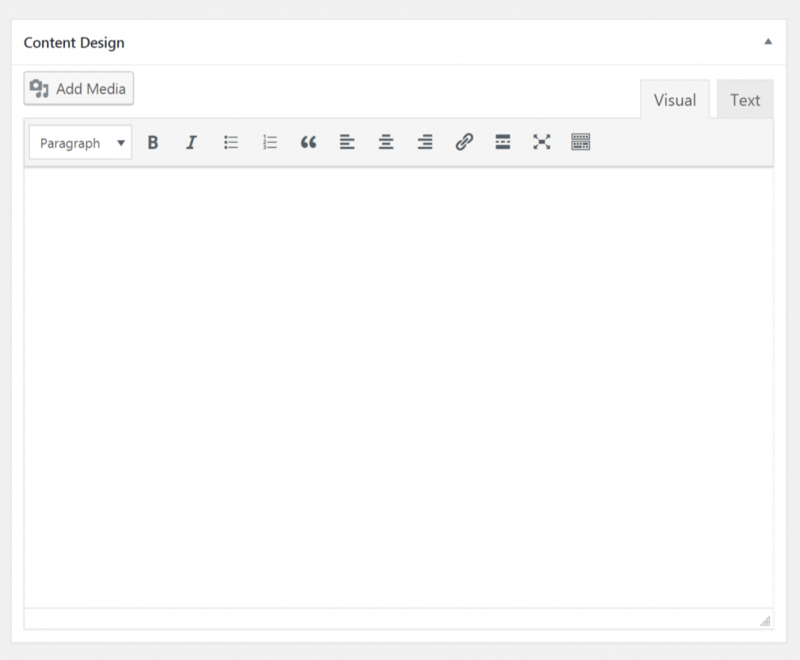 Content Design Editor enables you to design the structure of your template for the front end user. Structured Data Editor allows you to enable special search result features and enhancements.